Every year there are increased tourism movements in the commodity rich regions of Australia as tourists and caravanners holiday in the northern parts of the country enjoying the warmer weather. These are traditionally areas where Centurion operates its road trains and oversize loads servicing our clients and the local communities. Holiday makers and caravanners, as well as road users in general, are often relatively inexperienced when it comes to interacting with road trains and wide loads and this can increase the risk of incidents between these loads and the other road users. Evidence from a Centurion driver survey identified more than 80% of truck drivers said they had witnessed or experienced at least one close call between road trains and caravans in the past two years. We are wanting to create awareness among road users, holiday makers, caravanners and communities of the risks of interacting with oversize loads and road trains and to provide advice on the most suitable actions and procedures to ensure everyone makes it to their destination safely. You can view our road safety tips flyer here. Space / Signal: If you’re travelling in a convoy or part of a number of caravans close together, leave at least 100 metres between you and the caravan in front. Truck drivers find it particularly difficult to overtake slow moving caravans that are part of a tightly packed convoy as it doesn’t leave them room to pull in after overtaking. Speed: If you are about to be overtaken by a road train maintain a consistent speed, don’t brake or slowdown, and definitely don’t speed up. The driver will time their pass based on your speed so keeping it steady will ensure they can pass safely. Lights / Indicate / Pass: keep your lights on so your car / caravan can be clearly seen, especially if it’s dusty or overcast conditions. If you want to pass, keep your right hand blinker on to let the truckie know. When everything is clear, accelerate at a safe and consistent speed and pass. And remember it’s always good to acknowledge when people do the right things with a wave and a smile. Patience: Passing a 50 metre road train can take as much as 60 seconds. That equates to approximately 1.5 km of road needed to pass safely. Be patient and pick the right time. Make sure that there’s nothing coming in the other direction and you have maximum visibility of the road ahead. 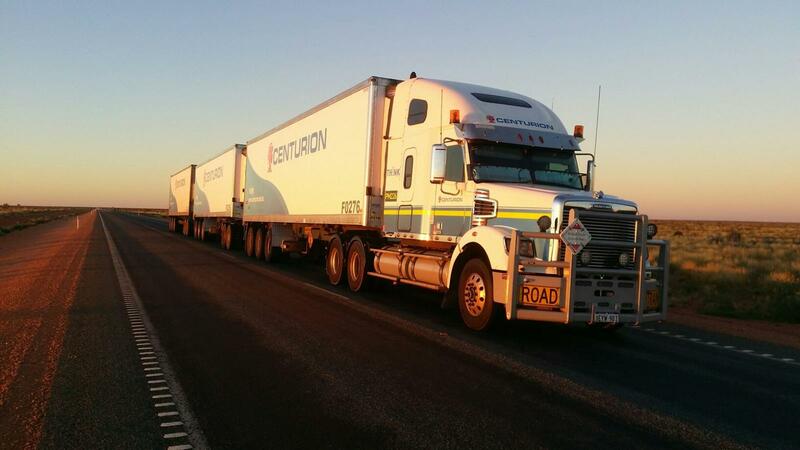 Positioning / Communicate: When overtaking a road train you’ll need plenty of space. Position your vehicle so you can see any oncoming traffic and so the road train driver can see you. If you’re too close you won’t be able to see oncoming traffic. If you have a UHF radio then radio through on Channel 40. Identify the truck and the direction they are heading and general location – e.g. Caravan calling Centurion truck northbound on Great Northern Highway north of Newman – and ask if it is clear to pass. This flyer is a guide for drivers touring during the winter period and is intended for information purposes only. The information contained in this flyer is derived from independent research and does not replace any road traffic rules, codes, laws, acts or regulations. Centurion and its affiliated companies do not warrant or represent that the information contained in this flyer is complete or suitable for the reader, recipient or driver’s purposes. Drivers must exercise their own independent judgement, care and skill, and assess the road, traffic and weather conditions existing at the time before considering whether it is safe to overtake any road vehicle. Centurion (and its affiliated companies) assumes no risk or liability in the event of any loss, death, injury, damage or claim in relation to any persons or property arising as a result of any reliance on the information contained in this flyer, including any conclusions that may be derived from it.